APQC recently concluded its latest financial management “trends and challenges survey”−260 midsize to large organizations from around the globe participated in the survey −and the data shows some interesting results. In terms of process areas, overall the general accounting and reporting process was rated the highest in priority (80 percent of survey participants indicated that this process will be an area of focus for them in 2018), followed by the internal controls process. Interestingly, financial shared services was the lowest-rated process, although a little more than half of survey participants said that this process was still an area of focus (Figure 1). Across the board, respondents rated implementing new technologies and capabilities, identifying and implementing best practices, and standardizing processes as key activities for 2018. 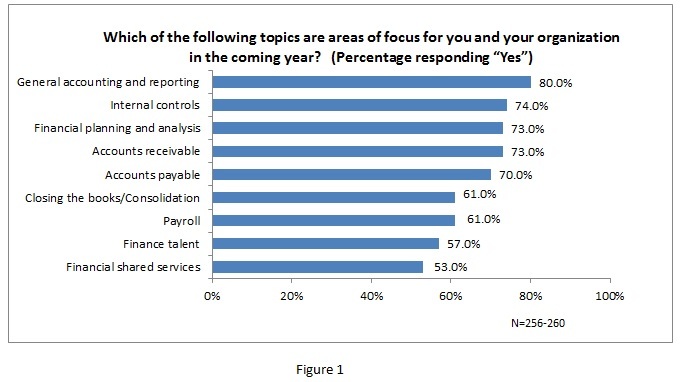 For the general accounting process, participants rated process standardization (67 percent rated this activity as “high priority” or “essential”) and the implementation of new technologies and capabilities (63 percent rated as a “high priority”/”essential”) as key activities of interest for this process in 2018. APQC’s Open Standards Benchmarking research has consistently found process standardization to be a key driver of high levels of efficiency and increased quality. 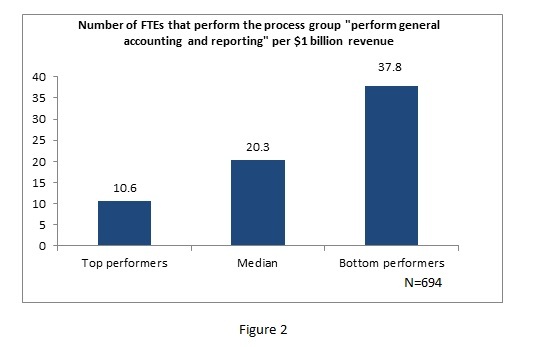 Top performers in the general accounting process leverage such drivers in order to more efficiently perform the general accounting process (Figure 2). New technologies and automation such as cloud computing, artificial intelligence, and other digital solutions for finance were also of high interest to survey participants. In fact, in a related survey, APQC research found that organizations are increasingly focusing on back-office functions like finance for digitalization and process automation. Join Steve Player, senior research fellow, and myself on Wednesday, February 21, for a webinar to hear more about the results of APQC’s latest financial management survey, including key priorities and challenges for finance over the coming year; obstacles to improvement; participants’ overall assessment of finance’s effectiveness; and the budget expectations for 2018 for finance. Steve is a senior research fellow working with APQC's financial management research team. He has more than 30 years of experience with improving performance management and implementing strategic planning processes. As North America program director of the Beyond Budgeting Roundtable (BBRT), co-author of the books Future Ready: How to Master Business Forecasting and Beyond Performance Management, as well as five other books, Steve brings a wealth of expertise to APQC's financial management research. In terms of future events to watch for, Steve will be representing APQC as a panelist on an upcoming virtual panel from CFO.com on "The CFO Playbook on Budgeting" on Tuesday, March 6. We hope you can join us on Feb. 21!